I purchased 4 of the chaise lounge chairs for our tanning ledge around the pool. They've held up well after 1 pool season, hoping they last for longer than the rattan chaise lounge chairs we bought from Overstock 3 years ago. Overall, they were easy to assemble, took my husband and I about an hour to assemble. They look great and are definitely sturdy. The classic style presented in this chair is undeniably timeless, a sophisticated seating solution for outdoor areas. Powder coated steel is every bit as strong as it looks, blending superior construction with artfulness for a lovely look that your back patio will welcome. Dimensions 28.0 In. X 5.0 In. X 59.0 In. I finally found a cushion to fit. Purchased this months ago and could not find a cushion that I thought fit this chaise lounge. I wanted to order off of OS but could not find one that I thought would work. Ordered from another popular Home decorating site. Was able to get the name brand cushions that fit. The measurments of the cushions I purchased were 23 W x 74 L and 4 in thick! They are sooo comfortable now! The cushion is a bit narrow but still works. I hope this helps someone else trying to find cushions to fit. Very pleased with my purchase. Also purchased the side table that matches. I purchased this chaise lounge in preparation for my retirement next week. I wanted something that was well built yet stylish; something that would hold up to the hot humid weather of the southeast. This chaise is powder-coated steel; strong enough to flop down on without worrying about offending the delicate sensitivity of lessor chaise lounges. I was not prepared for the quality of this product. And I was also surprised that the manufacturer paid so much attention to detail in pre-assembling everything that could save the buyer's efforts upon arrival. A small bag -what amounted to a handful of bolts and nuts, with 3 wrenches were all I needed to assemble the chaise lounge. And assembly took less than 20 minutes - some of which included me stopping to admire the build. This chaise lounge is a solid foundation for any lounge cushion, and I found an excellent match right here on Overstock.com. Well made. Easy to assemble. Comfortable. 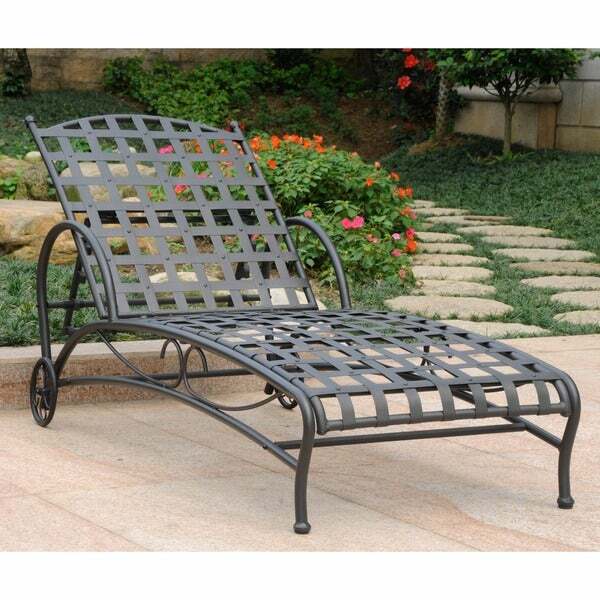 Purchased Item # 14159105 Sunbeam 72-inch chaise lounger cushion. Beautiful pairing. I put this together in 15 minutes by myself. Looks much more expensive and is really pretty. I like that there wasn't a lot of screws and piecing it together as most parts came already welded together. Just attach seat to legs which come in 2 long pieces and the back to the back of the legs. Very easy and I love it - great price too!! Have been looking for a less expensive, not plastic or web, lounge chair for a while and finally was able to purchase two of these when they came back in stock. They are very sturdy and are a good deal for the price. Assembly was easy. You will probably need a cushion to lay comfortably on them. They appear to be a coated steel so they will rust if the paint is scratched. The rubber on the wheels fell off after one season, but not a huge concern for me and can easily be replaced. I would definitely buy these again! This is a beautiful chaise lounge, easy for my uncle to put together in 20 minutes, and very sturdy. It is quite heavy (55-pounds) but it had wheels on the back so very easy to move around the deck. I love it and thanks!! We have a small patio area and can only fit one lounge chair and this one is perfect. We also get strong winds so this is nice and sturdy but very nice looking. Look nice. Easy to assemble. This is going to last a lifetime. It's a classic. It's not inexpensive but I've priced similar chaise lounges that go for far, far more. It's got the look of a vintage poolside chaise and that's eventually what it will be used for. It's strong, it's classy, it's worth it. I love it. Note, the cushions for this are wider than most so bear that in mind. I didn't have too much trouble finding any but you do have to search a bit. Love, love, love it! Really disappointed in this chaise lounge. Purchased on June12, 2013 and when I put it away for the winter (I live in OH) there is a lot of rust already ! For the price I expected it to haold up much better. I tried contacting the company by e-mails and have never recieved a response. The syle is o.k. but the seat is very uncomfortable unless you have 2 cushions on it. I'm sure there are other companies that offer a much better product that will hold up in the weather, which it is supposed to do. This chair was outside on my deck for less than 2 weeks. It had only rained twice when I noticed rust along any area not covered by cushion. When I called Overstock to return the chairs, I was told to take them (55 lbs each) to a UPS location and send them back. When I said I wanted them to be picked up but needed boxes to be sent to me, Overstock told me to "go somewhere and find some boxes""maybe a furniture store". This is such POOR service. And such a POOR QUALITY product. I will take my business elsewhere in the future and recommend that others do so as well. Bought two of these 3 yrs ago! Very poorly made, started to rust out after the fist season in weather (live in SC), had them sanded and professionally painted and even worst after 2nd season! Just gave away to Good Will. Easy to assemble, sturdy, quality packing - assembled in < 30 minutes by one person. Hardest part was figuring out how to balance large pieces so I could work on it. Love this line, have the chairs and side table as well. Stands up to desert heat, wind, sand. I bought this chaise lounge for my daughter's anniversary. We were impressed with the weight of it and it is very comfortable. I would've given it 5 stars but it came with a few dings and rust, which we quickly painted over. I believe not enough packing material was the culprit here. All in all very pleased and will buy another one next year. I bought these about two years ago to sit by our new pool deck. Was looking for iron that specifically stated would not rust - They started showing signs of rust within the year. We still use them because they are covered by a cushion but will have to spray paint them or replace them within the next year or so. Very nice chaise lounger looks great on our patio. Very sturdy to sit/lay in. The wheels probably won't last all that long though as the rubber was already starting to wear off out of the box, for the price, they are replaceable. Not so happy with the overall product. Rust to fast. So far very pleased with this chaise. It was super easy to put together, instructions were clear, and all hardware was present along with a few extra bolts and screws. When assembled it really looks and feels like a quality product. The all metal construction was something that I really wanted and spent a fair amount of time researching. All the other chaises I looked at were either a lot more money, or were maybe a little less expensive but did not look nearly as nice. The finish appears to be better than average, although there were a couple minor scratches that probably happened in transit. We've had a couple rain showers here in L.A. the last few weeks but I do not yet see any evidence of rust. So we shall see how well it holds up through the first full season. I was able to find weatherproof covers to protect them when not in use along with some really nice Allen Roth cushions at Lowes. Lovely, but limited adjustment so we rarely use them. Very comfortable, plus easy to move to another spot with the wheels! "is the required cushion oversized?" I purchased the 22x72 and it fits perfectly with a little over in the end. Item # 14159105 Sunbeam 72-inch chaise lounger cushion. "Is everything made of metal, INCLUDING the woven slats that your cushion lays on, or are they plastic or some sort of material like that?" "What is the weight capacity for this chaise lounge?" My husband weighs 300 pounds and he found the chaise lounge to be very sturdy and supportive. "Does the chair lay flat ? Want to sunbath on stomach for back tanning,"
This chaise lounge lays flat. "The color choice under the picture lists antique black, but the choice box says pewter. Are they the same?" The black is not available at this time. We do have 4 options and pewter is one. "Where is the chaise manufactured? Thank you." Hello Marthybrzi, this is made in China. Thanks for shopping with us!